Nice photo! I love picket fences. I had one at my former house that my husband built for me. We had a white house so we painted the fence blue and planted pretty flowers. It is a very pretty scene. White picket fences are so charming! What a pretty scene, the cottage, gate and archway are pretty.. Great shot, have a happy day! I adore picket fences! This one is no exception! The arch is lovely and adds such interest! The cottage looks so wonderful too. The duplex had a picket fence around it when I was a little girl. I hope to put it back one day.Thanks for the inspiration! Picket fences are so charming. And that arch is the perfect touch! I remember the days when this picture perfect scene was the heart of newly weds. All that we dreamed of. A sweet cottage with a white picket fence. Have a great day my friend.. Very pretty, and so inviting. Love white picket fences, and lovely arches. What a delightful cottage...with it's gate and picket fence. Hi Celeste. What a sweet little cottage with the picket fence. There's just something about these sweet little fences that say 'charming'. We had a little picket fence put up in our backyard for our little Chloe Dawn and she was able to play out in the backyard for a few months before she went to heaven. Folks around here don't have fences! I love big tall Texas fences for privacy in the back but we went with the pickets instead! Hope you're doing well. so darn quaint and pretty! thanks, celeste! Dreamy place and dreamy fencing. This is a very pretty place! I love picket fences and always wished I had them. Have a wonderful day! I agree that is a very charming place and fence and the archway is really nice. Loved the pretty blooming plant as well. Who doesn't love a picket fence? It looks so inviting! you seem to find the prettiest little fence scenes. this is such a lovely setting. A very neat fenced in cottage. Someone is taking good care of it. Thanks for stopping by my place today. In my old home I had a white picket fence with an archway just like that! And roses growing along it! Miss it. Wishing you and your hubby a very delightful Valentine's Day my sweet friend. what a beautiful fence! This place looks so warm and inviting ...I guess, there is a wonderful hom waiting behind this fence. Thank you for this lovely picture! sending Love and hugs to you, my dear friend! White picket fences and roses get me every time! Looks like a beautiful place to visit! Thanks for sharing! Good morning, Celeste! I am late, but happy to be here on this FRIDAY! YIPEEEEEEEEEE! I LOVE a picket fence, and around a charming cottage, all the better. Our neighbor has one around his lovely little cottage, and I really wish other people on the block would put one up. We can't since it would look odd with our style of home. You know what I'd love to do? I'd love to paint our brick WHITE! DARING! But I doubt if my husband would go for that. So pretty! Looking forward to your trip back to see what blooms!!! I love picket fences, reminds me of my last home in Beaufort. I had jasmine climbing on the fences, it was so pretty! Have a lovely weekend. Oh, I love that fence. It looks so charming and inviting. Thanks for sharing. Happy Valentine's Day, sweet friend. Hugs to you! I love the fence and the archway. Wouldn't a winding cobble stone path that leads up to it be perfect? A trailing rose, yes, but what color? Yellow? Pink? Maybe just an old fashioned white one. Have a wonderful valentine weekend! A beautiful photo, dear Celestina, oh what a romantic place to live,... I`m sure roses will bloom there in summer, and everything look even more lovely and sweet. Hugs to you, and a happy weekend. I love picket fences...and this one in the photo is beautiful!! This cottage is very pretty, dear Celeste. I can imagine all the beauty of the roses in summer...a romantic dream! i just love picket fences--just charming! enjoy yoru valentines day, celeste! that is just beautiful! Love sweet little storybook type cottages! 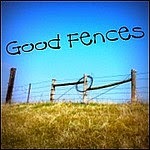 I did "good fences" this time too, sure love seeing them all! Happy valentines day! Love the fence and arch, they fit together so perfectly. I'm sure a welcome would await beyond that fence. What a lovely place! White picket fences are my favorite. Picket fences are so pretty but, for my style of living, entirely useless. Dogs would love a picket fence, they could jump right over -grin-.